We established the following rules so that players can have a pleasant time at our club. Please also take off cold-protecting clothes (wind breaker/down jacket, etc.) inside the restaurant. Please refrain from entering with T shirt, sweat shirt, jeans, jacket, hi-neck, sneaker, sandals, bare foot, etc. Please wear collared sports shirt or cuffed turtle neck. Please refrain from wearing clothes with flashy design and pattern. Please tuck the shirttail inside the slacks, and do not hang it outside. Please refrain from wearing cargo type pants that comes with large swelling pockets, and shorts. Please refrain from hanging towel around your neck, shoulder, or hang it down your waist. If you decide to wear shorts, please make sure to wear socks or short socks. Please make effort to wear well composed clothes deemed appropriate for golf etiquette. You are allowed to wear functional shirt underneath half sleeves shirt, but please make sure it does not have flashy color or pattern. If you are male, please refrain from wearing baggy pants such as cropped pants. If you are a member, please make sure to inform guests about our dress code policy. Please only smoke at the designated smoking area. If you decide to smoke inside the course, please smoke at location that provides ashtray near the teeing ground. Please only use the mobile phone at a designated location inside the clubhouse. Please gather in front of the start point of teeing ground 10 minutes before the scheduled start time. Please aim to finish half round in 2 hours. Please make effort to play fast. 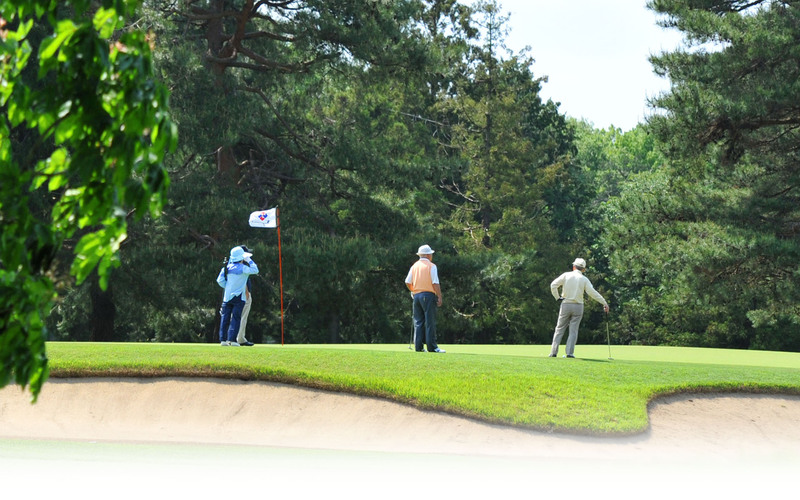 To speed up the game, please make sure to bring 2 to 3 clubs when the ball enters inside forest or hazard zone. It’s dangerous to swing the ball toward the group in front. Please make sure to keep adequate distance from the group in front by following the instruction of caddie. When you enter inside the bunker, please make sure to enter/leave from the lowest spot, and smooth off the ground by yourself. Please fix the ball mark on the green, and please do not drag the spike. When there is more than 1 hole gap between the group in front of you, and if the group behind you is waiting to play, please allow the group behind you to go in front of your group. Use of metal spike is prohibited.